Utilizing pre-tax retirement plans is a great way to reduce your taxable income while putting money toward your retirement. When you make contributions to a tax deferred account (ie. 403b, 457, 401k or IRA), your money goes in pre-tax. This allows you to invest more since you don’t pay taxes on these dollars until you are ready to take withdrawals. 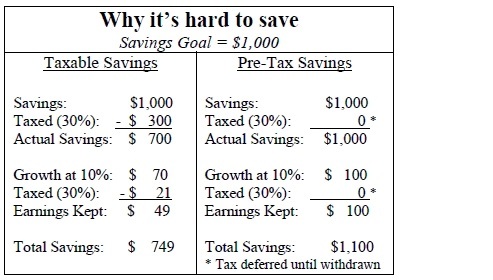 What’s the Benefit of Pre-Tax Savings? You may be surprised that HOW you choose to save can actually impact the amount you are putting away toward retirement. By taking advantage of pre-tax savings, you are able to save more efficiently while at the same time, maximizing your take home pay. Here’s an illustration of the impact pre-tax savings can have on the income that goes into your pocket. The chart is for illustration purposes only. Utilizing pre-tax benefits can make it easier to save for retirement. Tax deferral allows you to save more then if you were to save in a taxable investment account. This is because earnings that would normally be taxed now are deferred until withdrawal and can go toward your retirement asset accumulation. In other words, pre-tax savings allows your money to work for you today! The chart is for illustration purposes only and should not be considered a projection of potential returns on any particular investment. All withdrawals are subject to income tax in the year they are withdrawn. A penalty tax may be imposed for early withdrawals.